Recycling clay is not the most exciting part of being a ceramic artist, but it is necessary. We all end up with clay scraps when making pottery, and because this happens at various stages in the cycle, we need a way to bring all of that clay to an even level of moisture and consistency so it can be used again. If everyone had the luxury of having a pug mill at their disposal, I wouldn’t need to post this article, but the reality is, a great many potters have to reclaim clay by hand. And there is no one way that works for everyone in every studio. So in this post, we present an assortment of simple tips for recycling clay without a lot of equipment or hassle. – Jennifer Poellot Harnetty, editor. A screen over the scrap clay barrel keeps out tools and sponges, especially the dreaded needle tools. The work we make generates discarded clay scraps from trimming and slop from throwing or handbuilding. Whether you make your own or buy prepared clay, you need to decide what to do with used clay. For some, the solution is to throw the scraps in the dumpster and dump the slop down the drain, which isn’t really a solution. It’s economically and environmentally wasteful and can wreak havoc on your plumbing, sewer and septic systems. All discarded clay‚ except that which comes in contact with plaster or other contaminants‚ all is recyclable and reusable. Reclaiming it requires planning a system for your particular studio situation. Although there is no one way that works for everyone, some basic guidelines can make this job easier. A trash container of some sort is the key to any system. Placed on wheels, it can be maneuvered anywhere in your studio. Remember that when filled with clay scrap, slop and trimmings, it will be very heavy, so buy a heavy-duty container, and use heavy-duty casters for the dollie. Pouring the scrap clay through a framed screen that sits on top of the container breaks up the scraps into smaller pieces and catches tools that got lost (see above). When you are done with a day’s work, dump your throwing slop and any scraps into the bucket. If you plan to recycle scraps that have fallen on the floor around your wheel, make sure there’s no non-clay debris on the floor first, otherwise you should simply throw these scraps away as the foreign matter could cause problems. Rather than using a broom, use a metal dustpan and your hands to collect the clay. As the bucket approaches the top, decant the water. As long as there is water over the layer of clay in your recycle bucket, the clay scraps will all break down and become thoroughly saturated. If there are lumps or dry material in the slop, the resulting reclaim will have hard and soft spots. You don’t have to mix the clay in the bucket with a mixer. Let the water do its job. Learn more about the clays, glazes, materials, and supplies you use in your studio in Richard Zakin’s Electric Kiln Ceramics: A Guide to Clays and Glazes. Place recycled clay on a porous surface and allow to dry. Flip the clay over occasionally then wedge and store. The resulting very wet scrap usually needs to be dried out before reprocessing can continue. Here‚’s a list of the more commonly mentioned and used methods. Spread a thin layer (2-inches or so thick at most) of scrap onto an absorbent surface (figure 2). Plaster bats (learn how to mix plaster), wedging tables and large plaster slabs are good choices for this. A material called HardiBacker Board works very well. This is a heavy cement board that is not as effective as plaster, but is strong and will absorb moisture from the clay. Caution: do not use sheetrock. This is thin and porous, absorbs water very quickly, then the paper delaminates from the surface and the boards weaken. Flip the clay slab over periodically (it should pull away from the surface easily when it is ready to flip) and continue to do this until it is right for wedging. Store drying bats on a vertical rack or ware cart to save space. Note: the HardiBacker boards need a board underneath for support. Some potters prefer to dry their reclaim outdoors. Note: cover the reclaim with a sheet or other breathable fabric if you live in a windy area to prevent foreign materials from getting in your clay. A fan can also help dry wet clay more quickly. This will accelerate the drying, so turn the clay frequently. Another practical method involves a rudimentary filter press system made from cotton pillowcases. Simply fill the sacks with clay slop and hang them up, either over a bucket or outside. Excess water eventually drips out over time and evaporates from the surface. artist, bats, ceramic, ceramic artist, ceramics, clay, clay slab, collect, collecting, consistency, dry, drying, electric kiln, electric kiln ceramics, equipment, excess, glazes, guide, handbuilding, how to, how to mix plaster, kiln, kiln ceramics, learn, make, making pottery, material, materials, methods, mixer, note, paper, pieces, plaster, potters, pottery, pouring, pug mill, recycling clay, richard zakin, scrap, slab, slop, solution, studio, supplies, support, surface, throw, throwing, time, tips, tools, trimming, use, various, ware, water, wedging. Thanks to ALL contributors for this post back in 2011 – I have only just found the page and was rather disappointed with the fairly obvious main article. But then I started down the ‘Comments’ thread and found SO much useful advice! Hope you are all still at it! Hydrobats from TheCeramicShop work great for drying. They are made of a special plaster that doesn’t cause any problems with clay. The smaller the clay particles, the better the plasticity. The catch being, that, for the clay to be plastic, there has to be a layer of water molecules between the clay platelets. It takes longer for water to penetrate between the small platelets than it does for it to get between the larger ones. When you recycle clay by drying it out so that it slakes easily when added to water, you remove the water from between the small particles. It takes time for the water to get back in between them again. This is called ‘ageing’. Up to about 8 weeks or so, clay gets more plastic with leaving in a moist condition. Some people believe that the longer you leave the clay moist, the more plastic it becomes. When throwing on the wheel, it is the small particles that come off on the potter’s hands. Wheel slops then, must be carefully saved and added to the rest of the scraps. For plasticity, it is better that the clay scraps are kept soft and wet, rather than being allowed to dry out. Quendas, your post provides an interesting description of what actually happens when you’re reclaiming clay, and why reclaimed clay can turn out to be less plastic than the original. It’s also interesting to read about why aged clay sometimes acquires a “bad” smell — that the bacteria involved actually help the clay to become more plastic. 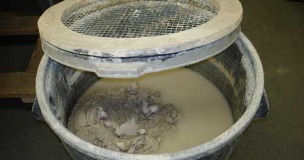 Besides making sure to add the slurry from your throwing bucket, could it also help the plasticity of your reclaimed clay simply to let it age enough to acquire a nice culture of these smelly bacteria? I throw all my scraps into a bucket and then mix that with new clay in the pug. Lately, this mixture isn’t working. No plasticity…when opening a bowl,the rim just tears open, doesn’t stretch. Any fix for this or should I trash the whole lot and start fresh? My answer: Beer. I use to add a small can of beer to the clay I made back in college. It makes the clay smell good and helps encourage plasticity. Just bee careful not to add too much or you will end up with a slime monster! I have several large plastic bread trays (12), about 2’x 3’x 4″ free from a bread distributor. They stack. Heavy fabric ($2/roll from an upholstery outlet) on top of each tray makes a great way to evenly dry reclaimed clay. As an elementary art teacher they are indispensable for drying kid’s projects. I sometimes put an entire tray in a trash bag to keep an entire class’s work damp until the next week’s class. I just wish the bread distributer would give me the rolling rack that would hold about 10 trays. Ask your bread man when you see him at the grocery, they replace the trays regularly. To remove excess water that remains after slaking clay without disturbing the clay try this: allow the clay to thoroughly settle to the bottom of the container, then use a thick sponge to wick-away the the water. Squeeze out the sponge into another receptacle, and repeat as needed. Your clay is ready to dry and wedge! For Diana with the hard clay. You can submerge entire bags of clay in buckets of water. Just be sure the top of the bag is above the surface of the water and be sure the clay bags do not have holes in them. The water will slowly permeate the plastic bag and rehydrate your clay. The dryer the clay, the longer it takes…up to several weeks. You can add some water inside the bag to accelerate the process. The bone dry clay might turn to mush. I got this tip from a Peter Callas workshop. He uses an old bath tub on wheels for soaking. Quicker method: If the clay is soft enough, use a wire to cut it into “hamburger patties” and drop them into a bucket of water. Allow to soak until the outer surface of each patty feels a little gushy but the core feels a little firm. Remove the patties from the water, put into a clay bag, and smash into a cube. Allow to sit for about a week to homogenize, then wedge. If you end up with oversoaked mush, leave the bag open for a while to evaporate some moisture. Learned this method at Haystack. I simply throw my scraps back into an empty plastic bag the clay came in. When I have about 10 pounds of scraps, I let it dry out to a workable consistency and then I throw the bag on the ground a few times to mix and firm it all up. (really wet bags of scraps can be left open outside for a time to quicken the drying process) Then I cut the clay into small amounts to be used later. You can wedge small amounts for throwing, or use it right out of the bag when slab rolling. 28 years and lots of reclaiming dry scrap have brought me to this process. I place a heavy cotton duct fabric supermarket shopping bag with handles inside out into a 5 gallon bucket. Fill the fabric bag with dry scrap and then add water until the scrap is fully saturated with some standing water. After about two days I hang the bag suspended over the bucket for another 3 or 4 days. This allows all the standing water to drain off and allows the clay to air dry with minimum handling. Check to see if the clay is ready by poking a finger against the fabric bag until the poke stays depressed. If timed just right the clay can be turned out of the bag and be ready for wedging. Having the bag inside out prevents clay from getting stuck in the raw seams. I also have two wooden boards covered with heavy cotton canvas where I palm out clay that is still too wet for final wedging. I find if you don’t try to do too much at once it works best, around 25 to 30 lbs or less at a time (wet clay weight). I save as much of my clay scraps as humanly possible but end up with buckets with too much water. When I siphon out the water it stirs up the clay. So I really like the cotton pillow case idea to get rid of that extra water. Thanks! I have 2 large refuse bins in my classroom for recycled clay. One is for the recycled “blocks” and one it’s for “bits” which the pupils break down themselves at the end of each lesson by “pinching” the clay breaking it off into small pieces onto a wooden board in the middle of their table. The bits are carefully dropped into the large recycling bin and one student has the job of spraying the even layer of “bits” with water. We don’t have a pug mill so my technician or any keen student knocks it into blocks onto a large cement block we have fitted by the sink area. The clay needs to be soft enough to combine easily without much effort. This is good enough for school use. The 20cm thick cement block allows force to be used when knocking the blocks into shape but a strong corner of a table with heavy wooden board is ok too. I do not use this clay for exam pieces – mainly for slab work – if the happens to be the odd air bubble inside it can be popped when rolling it out by hand. When I have scraps of leather hard clay I have a different lidded plastic box. Spraying leather hard clay is not enough. Using v clean damp towels I sandwich the clay into 3 layers inside the box as well as spraying the dry bits to add a steady level of moisture – and if too wet you can lift out the soft layers of clay out using the cloths. I only experience smells when the pupils have left tiny bits of paper in their recycled bits or a dirty cloth has been used and kept in the bin too long. It’s not harmful so we still use the clay and yes it’s texture is much better despite the smell !!! I never allow the clay to dry out completely in the classroom due to health and safety laws. Dust must be kept to an absolute minimum. I do in my own studio to create a slurry or slip as it breaks down really quickly and can make slip in minutes rather than days. Very sticky clay can be made into balls and stacked up on good quality wooden boards and covered with plastic – it slowly dries to a workable consistency. Timing and water level seems to be the key factors in recycling in the working classroom. Lots of fabulous ideas in this article and valuable comments – thank u all! I’m a hobby potter in a shared studio. I use heavy bisqued bowls instead of plaster to dry the slaked trimmings/slop. I leave them on my shelf loosely covered with plastic, and the clay is usually ready to wedge up the next week. I’m just a hobbyist potter, so I don’t have 50-gallon drums of recycled clay to worry about, however I do recycle all my clay, and I have an easy method that I’d like to pass on. All you need is a couple square feet of clean concrete floor. First, sweep the floor well, and cover the area with cotton cloth—I use old T-shirts that have been cut apart to make large sheets. Then dump the slops on the cloth and spread it out to make an even layer. Cover the clay with more cotton rags and allow to sit for several days, until the concrete draws excess water from the clay. When it reaches wedging consistency, the cotton layer on the bottom makes it easy to pull the clay off the floor. I have been away from my studio for two years and as a result, I have boxes and boxes of hard clay. (some of it is totally dry) Any suggestions for reclaiming/reworking this clay? Anybody else use fired clay tiles 2 inches thick to dry clay slurry? OOO – I just read someone said they add bleach to their alop to prevent the smell – I used to do that but it’s BAD for the clay. The number one best solution I’ve discovered is – don’t let it sit too long. The smell comes from an anaerobic cultivation. If you expose it to air, you kill that anaerobic activity. I have 2 recapture buckets – a tuff-plastic garbage can on wheels for my handworking scraps, and a wooden box on wheels that catches my wheel slop. The wooden box breathes enough to dry out the slop before it starts to smell. When it’s time to recycle, I transfer it all into the plastic bucket and top-off with water. One over night is long enough to slake everything. Then I slop-it out on big plaster tables. I save the finer slurry in the bottom separately, for slip. I used to have a big problem with smell, but I’ve learned if I stir my slip about once a week and if I let my recapture buckets dry-out completely before using them again, I never have any problem with smell. Actually, the smell comes from the bacterias busy breaking down the clay, and it’s a good thing if your clay smells. It means the recycled clay will have more plasticity. I even sometimes add some garden composting bacterias to activate the process! LEAVING THE BATCTERIAS DO THEIR JOB IS THE GREEN WAY, not the other way around, using chemicals and bleach and what not, because you have such delicate noses! Here in Japan, when potters buy clay from a clay pit etc, the leave it to mature for many years, in order to get a better, more plastic clay. I never mind the smell of recycling clay. Mold is good. It makes the Claymore plastic. I don’t know why people are so freaked out about mold and smell. It’s an organic material and it should not smell like fresh washed laundry. Where can you purchase lids with screens to fit over your trash barrels? Is there a simple way to construct you own screened lids? I would be interested in knowing if any potters have any ideas regarding how the water can be recycled and used again in landscapes or as grey water to flush toilets,etc. Wow! This is so timely! I just finished setting up our “recycling center” for clay in my classroom! I have a drying tray for scraps to go bone dry, a huge trash can of slurry for dissolving bone dry scraps, and a slurry bin for drying it to plastic stage. I added just a tablespoon of bleach to the trash can (30-gal?) and no smell. I wish I had known about the vinegar! We have probably 800 lbs of clay to reclaim! Now if I can just get the kids to wedge it all! 😉 Thanks, all! I am a hobby potter and use different types (and colours) of clay so, firstly, I am careful to avoid mixing the clays. Secondly, once the scraps are bone dry, I will crush the big chunks to help speed up the process. Thirdly, I put the scraps in the thick plastic bag in which the clay is sold then put a sufficient quantity of water in it and I place that bag in a big bucket of water. What that does is create pressure on the bag and its contents which further speeds up the absorption of water. I don’t need to leave it for very long before I can just pull out the bag, drain some of the excess water and let the contents dry for a few days before putting the clay on plaster bats (I flip the bag inside-out to scrape almost all of the clay). Being pugmill-less, I tear the clay pies into pieces, mixing different areas of consistency and then it’s wedge, wedge, wedge! I have a friend who recycles clay by pouring boiling water on the scraps. I don’t know if she waits for it to be dry before or anything; I’ll have to ask. I am an art teacher and we recycle clay regularly but put it into kitty litter buckets after drying the scraps from projects. We add water above the dry line and slake the clay down several days or more. These buckets hold about 30# of clay so are easily moved around the room and stacke; they also have a secure closing top to retain moisture level after reclaiming. To cure the smell when some organic debris starts to decompose, I add a little dish soap that has been watered down about 20-1, water to soap. The anti bacterial addition to the soap cuts the smell, the soap makes it smell so much better and the clay plasticity is not harmed either. This addition has helped the clay recycling tremendously. Siphon. To start siphoning liquid through a hose, you can take any hose (short, long, thin, thick). Fill it with liquid then clamp both ends (fingers will do). Put one end in the bucket (aquarium, etc.) to be emptied, the other end in the location where you want to liquid to go. Unclamp and voilà, let the law of physics take over. Liquid flows down hill, so make sure the tip in the bucket to be emptied is slightly higher than the other end of the hose. Instead of bleach to eliminate mold in your clay, use a few drops of clove oil. It’s available at drugstores, and smells okay. Vinegar is not going to remove mold from clay, in fact it adds food for mold, but it is a great addition to make the clay more plastic, which I find helpful for portrait sculpture. Another way would be to not let your bucket get so full (or sit too long) will help with the smell, and maybe managing the decanting. Otherwise, pour off what you can , then use a smaller container i.e. empty yogurt or cottage cheese container to scoop off the water, and some slurry, and place in in a smaller more manageable bucket. Let it settle in that bucket appropriately, then decant. As for smell, vinegar is very helpful, if you don’t mind its smell. Vinegar also works magically with very leather hard or even bone dry clay for attaching or repairing. Use it to mix your slip even. Great ideas. — I’d like to comment on the smell problem. One contributor suggested pinesol. I’ve added bleach myself. Can anyone suggest a more “green” solution? I’ve added vanilla, which is quite nice to smell, but the effect is minimal. Vinegar is key. Stops the smell and stops any mold growth that could happen. I find the best way to get rid of excess water without disturbing the clay and slurry underneath is to fold up a length of kitchen roll and lay it on top of the container, just touching the water surface.Make sure the overhanging ends are below the level of the water. The water then drips out by capillary action.I only do small amounts(ice-cream tub size) at a time, just being a hobby potter. I have a plaster “sink”, it is big enough to take my whole slop bucket after taking off the top water. I line it with a piece of old smooth sheet, which alows the plaster to absorb the moisture and stops trouble with plaster bits. I just grab the sheet and lift out the clay when I want to process it. I warn you about using supermarket bags for storage. In New Zealand the bags have been made biodegradeable. A few months and they break apart into small flakes. I recommend more sturdy bags, there are many free sources. A turkey baster works great for siphoning off the excess water or you can use a large bulb syringe at the end of a smaller diameter hose to get the suction going. Hi, folks, thanks everyone for your helpful comments so far. I’m a new ceramic buff and don’t go through a high volume of clay, and I do more hand-building than throwing. The first 5-gallon bucket of mixed slurry and scraps sat for a long time and smelled awful, so I’ve been wondering whether it’s worth it and have just been saving dry scraps and dumping the slurry since then (I do have a Gleco trap in my sink). But I like the suggestion of just doing one ice-cream bucket at a time – so, next time I throw, I’ll add some of the dry scraps to it and process it. Does anyone have any tips for “decanting” the excess water before adding the bone-dry scrap? do you just scoop it gently off the top, or do you siphon it off, and if so, how? thanks! I tried siphoning by mouth but got a mouthful of icky moldy clay water – yech! I let my scraps get bone dry as well and then just toss them into the slurry pail. That usually uses up the last of the water that couldn’t be decanted easily and then throw the whole thing on a plaser bat once the dryscraps have “melted”. Works for me. Rather than pillow cases which tend not to be strong enough to hold much clay, I would suggest cutting off old pants legs and suspending them. The challenge was one person loading the slurry into the open end of the pants leg with only 2 hands. It was solved with an 8″ section of about 6″ diameter PVC plumbing pipe that can be easily mounted and screwed vertically to a simple 2″x2″ frame and set over a tall 5 gallon bucket. The unsewn end of the pant leg is passed through the pipe, about 4″ of the end is folded over the lip of the vertically mounted 6″ PVC pipe and fastened with a strip of tire inner tube rubber. The slurry is then easily poured into the pant leg. After tying it off with a loop it can be hung in a breezy area for a few days as suggested. Last year I learned this tip from Ceramics Daily. I’m a “somtime” potter and my studio floor is concrete. I lay 4 or more “turkish” towels on the floor, prop 2 x 4s under the edge of the length, and after decanting most of the water in a 5 gallon bucket, I pour the thick reclaimed clay and spread it evenly on the towels. I turn it over replacing the top towel with a dry one, when the clay can be handled. Depending on the weather, it may dry quite rapidly. Two separate buckets , one for cone 10 scaps and one for cone 6 scraps because you do not want you clay melting onto your kiln shelf during a cone 10 firing opps! Like wow man ghow did thagt get in there syndrome, just mark the recycle bucket one for Cone 10 and one for Cone 6 Ta Da. See Boris a lot of happy face now that eh cne 6 clay isn’t melting on their cone 10 shelves duringh a cone 10 firing. Another thing after awhile you bucket of clay is going to stink, you know mold and mildew and when you scoop in on to a plaster bat eeeuuuwwww the stink, I just mix in a cup of pinesol and wow Jennifer it don’t smell so bad. All scraps of varying workability,including still damp trimmings,go in the trash can. All liquid scrap goes in a bucket to be later used to slake the thoroughly dry, pulverized clay (from the box where it had been waiting).Usually this slaked mush also finds its way into the trash can between layers of the stiffer stuff where it softens and equalizes the consistency. Then it goes through my pug mill along with fresh clay pieces which may have become too stiff for easy throwing.And compatible clays of different types or colors go through also. Easy, always available.Rarely, some soupy stuff is dried to puggable consistency in drying bats. As the others have said I make sure any trimmings and scraps are bone-dry before adding them to my throwing slop bucket. This ice-cream size bucket holds quite enough for me to process. When I see the dry bits have softened (overnight) I stir the contents and pour it out on to a large plaster slab. The cool thing is that I store this at floor level on 2x4s, on a piece of plywood which has wheels attached below. This way I can slide the plaster out of the way under my work table until the moisture is slurped out of the clay. It’s just a matter of rolling up the cowpat when it’s no longer shiny and putting it away in a plastic bag. When I want to use it I slice it up and slap the bits together in a different order and wedge it. Thank you for that reminder that DRY CLAY is easier to recaim than amy slighty damp clay. Desert, do your work, and I’ll get the buckets of water ready !!! Thank you, fellow mudders !!! Thanks for this. It is just what i need this week as i get ready to pour plaster bats and wedging table. I’ve got tons of slurry to reclaim! Many years ago, in the middle 70’s, I made trays out of 2×4’s. They have hardware cloth attached to the bottoms and then 1×2 strips running the length of the trays to support the hardware cloth. I line these with old bed sheets, set one down, fill with a 5 gallon bucket of slurry, set another on top of it, and repeat. They take up only about 2 square feet of floor space. When the clay in the top one has dried to the point it can be reclaimed, I put it into plastic grocery bags, using two per tray. These I store in plastic tubs until I’m ready to repug the clay. The grocery bags make it easy to move the chuck of clay and help keep it from drying out too much more. I live with high humidity, so it takes a long time to dry out but works out well in that I reprocess the scraps about 3 times a year. These tubs and wracks can sit under my table out of the way until ready for the next step. I’ve had many problems with plaster in the past so do not use it for anything in my studio. I appreciate everyones suggestions on reclaiming their clay. I was just asking myself what way could I do a better job than my current way of reclaiming my clay. I put two plastic trash can bags in a 5 gallon bucket, and throw all of my scraps in it. I then pour my throwing slurry on top of that, and let it all eventually break down. When all of the water has evaporated, I cover the clay up with plastic and let it all sit until I can get to it. I then turn the bucket over, dumping the clay onto my table, and start cutting it into managable chunks to start wedging. A Lot Of Work!! And also hard on the wrists to wedge that clay up. I think I like Pete’s idea better. Used clay breaks down in water best if it’s bone dry beforehand. I place my slurry on 1& 1/2″ thick plaster bats, cast in black plastic oil-drain pans I buy at WalMart. But rather than placing each one out to dry separately, I stack them up (plaster/clay/plaster/clay/etc.) like a big Dagwood sandwich. The drying is thus quicker and more even, as both surfaces of the clay mass are in contact with plaster. A big wooden wedge is sometimes needed to separate them, when the clay is ready to be removed and wedged. A hundred strokes are more than enough to get the clay “just right”. Of course careful handling of all plaster items is crucial, to avoid plaster chips that might spoil the ware later, as the calcium rehydrates and swells out. Pieces of sheet-rock works wonderfully if you put a piece of cloth between the sheet-rock and clay. That also keeps the sheet-rock paper “clean” so that it can be used with different clay bodies. Thanks for this article. I take the approach that it’s easier to get a good consistency of reclaim slurry (and re-introduce water of plasticity between the clay platelets) by letting my scrap clay dry entirely and then slaking it down overnight. I then blunge it for even greater consistency. I work in a small studio and I’m interested in incorporating drawer/slider hardware with my ware racks so I can slide out a large plaster bat to add slurry or flip my drying clay without having to lift the bat, and yet store in the racks, saving floor space in my studio. Alas, I’m no carpenter! Anyone have success with this approach? I’ve been using old bread racks. This keeps a lot of storage in a vertical manner.